Video: Can Patients Wear Wigs and Hairpieces After Hair Transplant ? Wigs and hairpieces are often used to cover up signs of hair thinning and balding in both men and women. They are also referred to by other terms such as: hair systems, toupees, hair prosthetics and non-surgical hair replacement. Patients of Dr. U (Dr.Umar), whether they are from Los Angeles or throughout the world have been using wigs and hairpieces for many years to hide signs of hair loss. Some even debate which is better: getting a hair transplant or wearing a hair replacement wig. Since this practice has been a major part of their grooming routine for so long, they often wonder if they can continue wearing toupees after their hair restoration surgery. Can I Wear a Hair Piece After Hair Transplant Surgery? In this Q&A video, Dr. U addresses the desire of patients to continue relying on wigs and hair systems after their operation. His advice is that that it is best to abandon the use of hair prosthetics and gives reasons on why this is the best course of action. When people lose their hair, they feel very self-conscious about the regions of baldness or sparseness on the scalp. An easy solution to resort to is to adopt the practice of wearing wigs and hairpieces. This offers an immediate sense of gratification for those who are not yet ready or willing to undergo hair transplant surgery. Some hairpiece products use a combination of both. The mesh itself is usually made of polyester or nylon to create a thin layer that appears more natural, especially for the hairline region. The main benefits of having a mesh base is that it is lightweight and cooler. However, it does wears faster due to acids released from the skin. In some hairpiece products, mesh is only used for the underside of the hairline portion. In others, the entire base is constructed of mesh. There are other types of wigs and hairpieces constructed with a polymer base made of silicone or polyurethane to avoid slipping. This type of material offers more durability, tends to last longer and is less expensive. On the downside, rubber-like bases can appear unnatural and trap more heat. These types of wigs and hairpieces should not be worn under any circumstance after a hair transplant surgery. According to Dr.U, the added weight of the polymer base will shift the angles of the inserted grafts which will undermine the appearance of the final outcome. 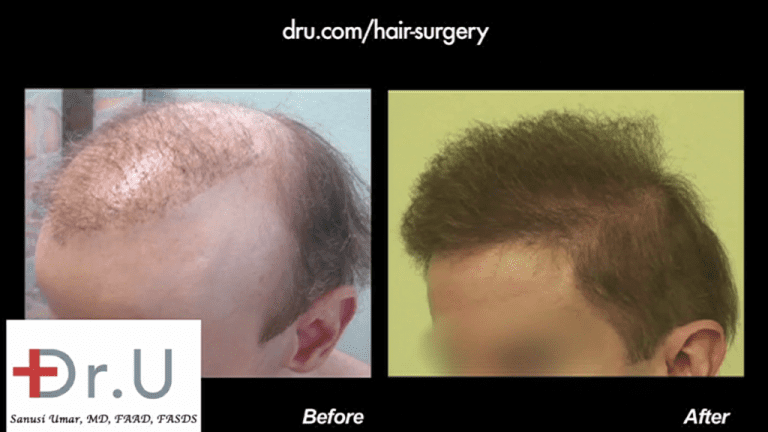 Many of Dr. U’s patients utilized one of these three methods prior to their hair transplant procedure, including those who needed to repair prior hair restoration surgical mistakes. Some wigs and hairpieces are affixed to the scalp using semi-permanent techniques that involve liquid adhesives such as polyfuse or natural bond. This method is also referred to as non-surgical hair replacement. The hair prosthesis is not meant to be removed by the wearer themselves, but rather by stylists or hair technicians. This is usually done about every five days to six weeks to remove accumulated dead skin cells, flakes, shed hair and other forms of debris. Any type of glue should absolutely not be used after a hair transplant surgery. These wigs and hairpieces use double-sided tape to stay on the scalp. Wearers can reattach the tape themselves. However, this can leave a residue on the skin. Dr. U recommends stopping the use of double-sided tape for wigs and hairpieces after a hair transplant. Wigs and hairpieces with a base made entirely of mesh can be safely worn using clips after a hair transplant procedure. This is only advised in cases where the patient must attend an important social event. The clips present on the underside would attach to the surrounding margins of hair. Following surgery, Dr. U advises that clip-on wigs and hairpieces are to be worn for a maximum of about 12 hours per day. Patients should immediately remove their hairpiece when they arrive home. What Happen If You Continue Wearing Wigs and Hairpieces After Surgery? As mentioned earlier, many of Dr. U’s patients are used to wearing wigs and hairpieces. They often wonder if it is possible to continue this practice after their hair transplant surgery. 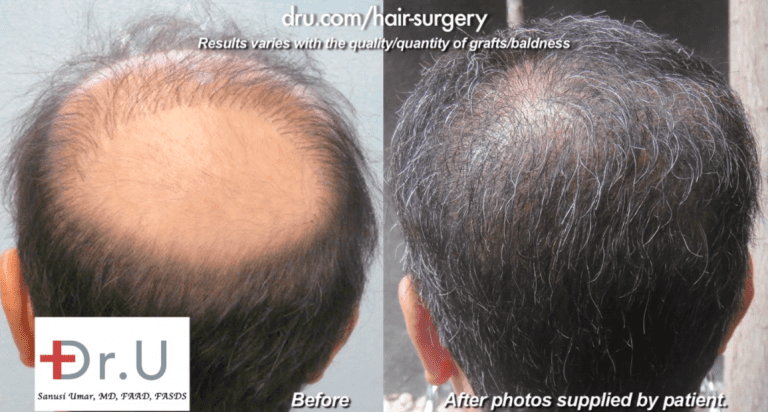 According to Dr. U, the occlusive effect of the base can damage the grafts and growth yield. The weight and pressure of a rubber base can change the graft angulation. Glues and tape adhesive can stick to the shaved hair shafts and also shift these angles. Furthermore, the wounds created during surgery provide vulnerable openings in the skin. And these types of chemicals can cause irritation. Sweating and moisture due to tapes, rubber surfaces or glue will encourage bacterial growth which is likely to cause inflammation and inflict irreversible damage to the newly inserted follicles. After a hair transplant procedure, it usually takes about three to four months before patients see the first signs of growth. Around the sixth to the nine-month point, many people are able to start grooming their hair. But this will differ for individual patients on a case-by-case basis. A major concern for many patients being seen with obvious signs of surgery following their operation. Dr. U recommends the use of loose hats, baseball caps or beanies after a hair transplantation. These head coverings will not press tightly against the surface of the scalp and cause harm to the grafts. What is the difference between a hair transplant and hair restoration? Do wigs and hairpieces fall under the category of hair restoration? The term hair transplant refers to the surgical process of extracting hair follicles and transplanting them to bald or thinning areas of the scalp. It is considered to be one approach to hair restoration which is concerned with the restoration of hair in general. While surgery is one way to restore hair, other means include the use of drugs or medications that may include the use of synthetic or natural chemical compounds. The use of wigs and hairpieces help to mimic approximate the appearance of a restored head of hair. But this practice is technically not a real hair restoration treatment. Is non-surgical hair replacement worth it? Non-surgical hair replacement uses liquid adhesive to affix a hair piece unit to the scalp. In the long term, this hair care method is quite time-consuming. It involves having a technician apply the base portion to the scalp. It also must be removed by a specialist periodically in order to clean up flakes and debris which have accumulated. The overall system can be uncomfortable for the wearer in hot temperatures as they sweat. It may not be completely foolproof as the position of the hairpiece may shift in wet conditions like when it rains or if the person wants to go swimming. Although it creates the look of a full head of hair, the wearer can still feel a sense of inauthenticity about using non-surgical hair replacement systems. Instead of wearing wigs and hairpieces, is it okay to use hair concealers after my hair transplant? Hair concealer products contain tiny particles made of synthetic chemicals. After a hair transplant when your wounds have not completely closed, these particles can enter the skin and may even cause irritation and inflammation. It takes about 7 to 10 days for the wounds to close. Most doctors recommending waiting for the skin to heal completely before resuming the use of personal hair grooming products. Although there are standard timeframes for average cases, it is best to speak to your doctor about when it would be safe to start using powdered concealers. As long as the skin has healed sufficiently, they would be less risky to the grafts compared to wigs and hairpieces which, again, can alter the angles of the inserted hair follicles. Meet a patient who was able to finally toss his toupee once and for all after his Dr.UGraft™ body hair to head transplant. Learn why a Dr.UGraft™ surgery makes the use of hair systems completely unnecessary for male pattern baldness suffers and victims of badly conducted hair transplant procedures. 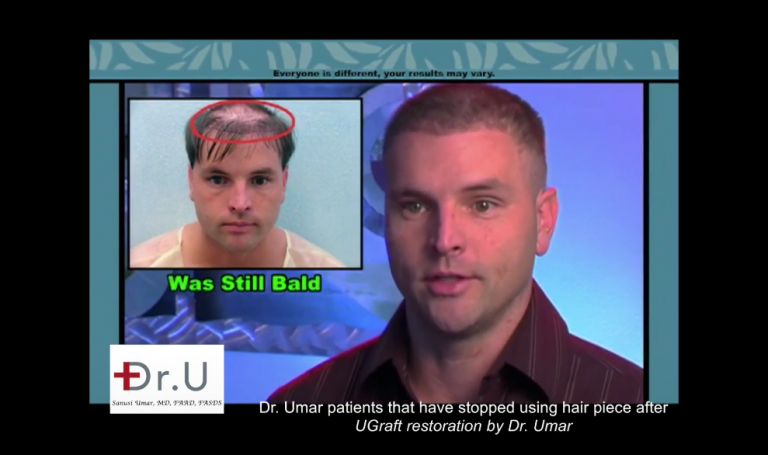 Discover a patient who opted for a hair transplant and hairpiece combination through a Dr.UGraft™ operation. How Long Does It Take to See Results After a Hair Transplant? What is The Connection Between Body Builders, Testosterone, and Hair Loss? Is it Normal to See Pimples After a Hair Transplant? Why Does This Happen?